Welcome back! to the Rustic Baby Shower party submission. Look at this gorgeous space. It's like a bistro just for the baby shower. Are you eyeing that back drop? I'm loving that POP of flaming orange. The ombre fringe was used as a backdrop for photo's. This is one idea I'm going to have to incorporate in at least one of my parties. Loving it! A popcorn station was set up with seasonings and kept with the rustic theme. The rustic look is growing on me. The party wheels are spinning. The mom to be. The backdrop adds a pop of colour and carries the colours from the ombre backdrop. While the accessories on the table and the log below continue the rustic theme. Thank you Lindsay, pictured here on the right (as you look at the photo). 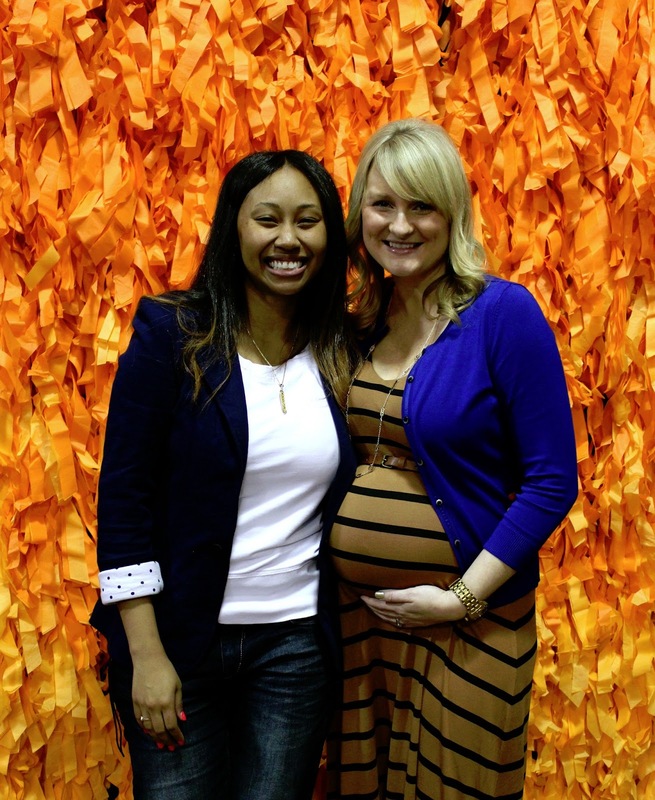 You and your baby shower dream team did a great job. To see more of Lindsay's work and the members of the baby shower dream team, click on the links below. Thank You so much for featuring our shower - we sure had a TON of fun honoring our friend! Thank you for sharing. This was a fabulous baby shower and I love the POP of flaming colour. Well, I LOVE me some rustic and this is such a sophisticated version of it! Also, it's nice to see a baby shower theme that suits a mom's tastes rather than the theme suiting what we imagine a baby's tastes to be since the party is actually *for* the mom and her adult friends and family. This baby shower totally made me dig on the rustic theme.